These metal fence panels have a modern appearance. Suitable for any residential environment. Restricts access to your property. 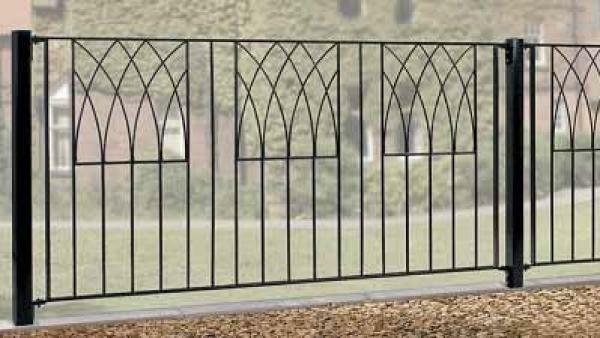 Manufactured from solid steel components the high quality Abbey Metal Fencing will create a great look to any property. Featuring a visually appealing overall appearance the fence panels are suitable for a variety of practical uses where there is a need to provide added security without having to compromise on looks and price making them a very popular option with the design conscious homeowner. Visually pleasing design will add charm and character to any setting. Manufactured from solid steel components. Abbey metal fencing is constructed with 25mm x 6mm frames, 10mm infill bars and 6mm infill panels. Supplied with a fittings pack that is suitable for fixing to brick, wood or metal posts. 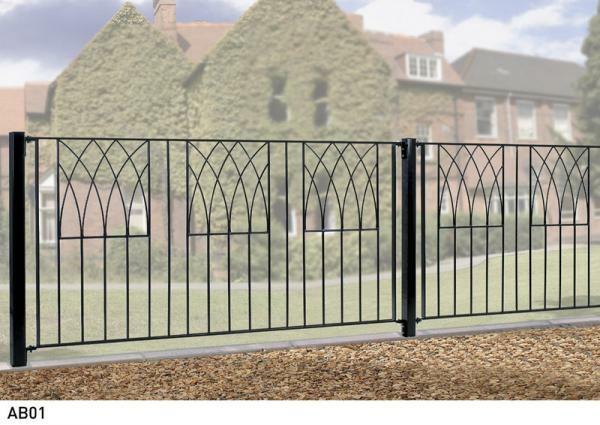 Abbey metal fence panels are available to order online with a factory applied black primer finish (must be painted before you install them) or a low maintenance zinc plated (electro galvanised) and black powder coated paint finish. Please be aware that the width stated represent the opening into which the fence panel will fit. We have already made an allowance for the space needed for the fittings. Looking for help ordering new metal fence panels for your garden? For further assistance working out the number of panels to order or don`t know what size will work best please contact us by phone or email. For more general queries please refer to our frequently aksed questions and ordering guide. In most instances you will need to order metal posts to provide support for the fence panel. If these are required we recommend the use of the following products. If you are unsure what to order or would like help with any aspect of your purchase call 0844 804 5577 or email sales@gardengatesdirect.co.uk and we will be pleased to discuss your options, offer solutions and answer your general queries.